Free iFlix subscription UniFi customer, Streamyx free iflix, UniFi free iflix, Streamyx iflix. You apply UniFi? Congratulations ! iFlix You can use the service for free for a year. UniFi customers only need to log on iFlix today , and you will be prompted with a message to access Flix for free for a year. 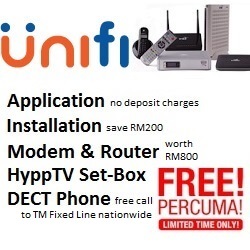 No registration required, and no additional charges are imposed on account of your UniFi . Through iFlix , users can enjoy a variety of content , TV series and movies also local , and international – and watch them at anytime , through any device you have . For customers UniFi , you can log on today to enable iFlix for a year for free . In addition UniFi , Telekom Malaysia also has said previously that the same services will be offered to users Streamyx 4Mbps and 8Mbps soon.